Bonobo AI, an AI-based platform that helps companies get insights from customer support calls, texts, and other interactions, announced today that it has raised $4.5 million in seed funding led by G20 Ventures and Capri Ventures. Founded in 2016 and led by co-founder and CEO Efrat Rapoport, the Tel Aviv-based startup claims that its technology has been used to analyze more than a billion interactions so far and that it has signed up a “few dozen” clients including DreamCloud and Honeybook. There are two main types of issues that Bonobo helps its clients with. One is opportunity detection, or identifying things that can either help the closing of a sale, like features that have proven popular among past buyers, or hinder it, such as customer questions that aren’t satisfactorily answered. By doing so, Bonobo is also able to help clients create very targeted marketing campaigns. For example, instead of sending marketing material all customers who need to renew their subscriptions, Rapoport says Bonobo’s clients can create campaigns to help retain customers who need to renew their subscriptions but have complained about the price being too high or missing a feature. Another example of how Bonobo can increase conversion rates is predicting customer cancellations and other potentially costly issues. For example, one vehicle repair company was losing millions of dollars due to cancelled jobs. Bonobo helped it identify factors associated with a higher likelihood of cancellations during customer interactions with the company’s representatives, which helped it retain thousands of customers. The second is risk detection. For example, Bonobo detects if a customer starts mentioning a competitor, threatens to post their complaint on social media, or brings up problems that are a legal or compliance risk. 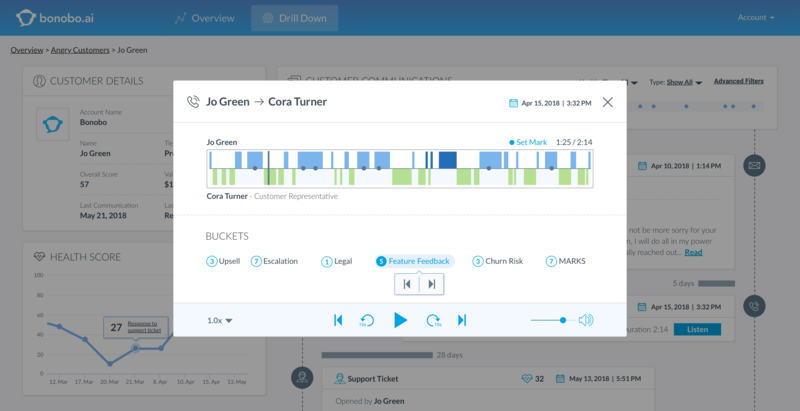 Rapoport says that Bonobo’s technology can identify specific segments in conversations, so companies can review it directly from Bonobo’s dashboard without having to perform a time-consuming search.